Of the more than five hundred people who attended the tenth anniversary Memorial Mass for Father Ray Brennan, most had never met the man. 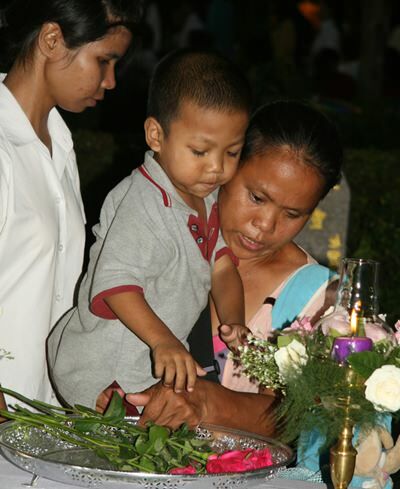 The majority of those who sat through the catholic service were Buddhists, but this did not stop them attending to pay respect to the man whose devotion to the underprivileged in Thai society will never be forgotten. But two people who new Father Ray very well, and who flew from Texas in the United States to attend the service, were his younger sister, Sharron Purtell, and his niece Amy. They came to attend the service, to remember Father Ray and to witness for themselves that the work he started is continuing, and they were not disappointed. Father Viyakorn, Vicar General of the Redemptorists of Thailand, along with Father Michael Weera from the Pattaya Orphanage and Father Michael Picharn from the Father Ray Foundation, lead the celebration of mass in honor of Father Ray. They visited the babies at the Pattaya Orphanage and played with the deaf toddlers. 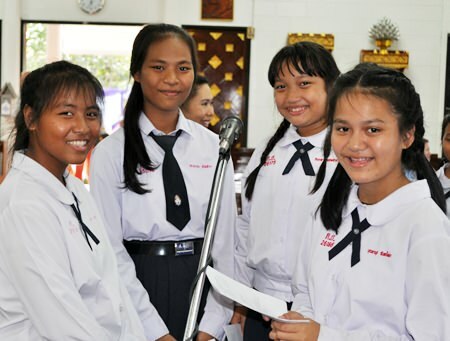 At the Father Ray Children’s Home they were entertained with a traditional Thai dance and an exhibition of Muay Thai, while the students with disabilities showed off their English skills. The youngsters at the Pattaya School for the Blind sang for them and the toddlers at the Father Ray Day Care Center all demanded hugs. For Amy, who was making her first ever trip to Thailand, it was an experience she will never forget. 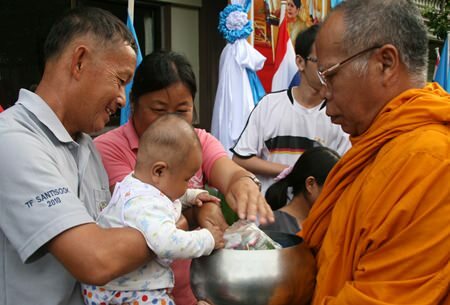 On the morning of the 16th August, the anniversary of Father Ray’s death, more than two hundred students, teachers, foreign volunteers and local residents gathered at the Redemptorist Vocational School for People with Disabilities to provide alms to monks from a local Buddhist temple, and to make merit for Father Ray. 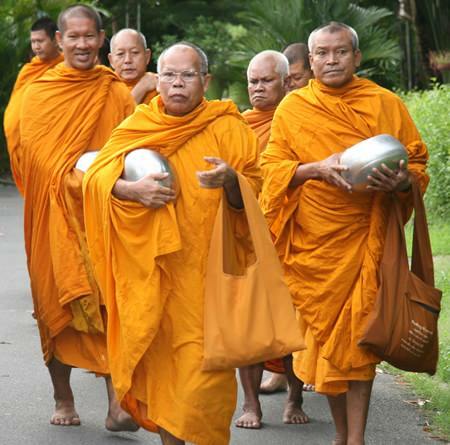 The monks arrive at the Father Ray Foundation. 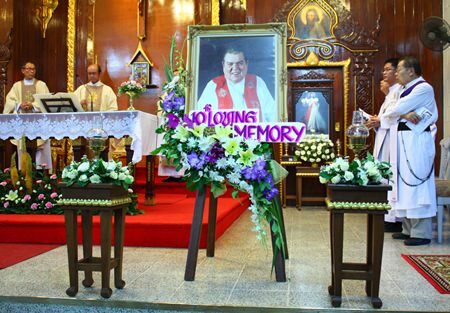 Twelve hours later, at St. Nikolaus Church on Sukhumvit Road, the anniversary Memorial Mass took place. 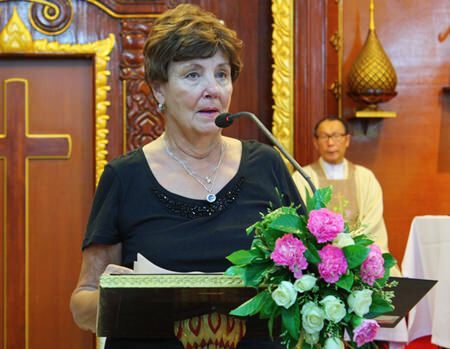 The service was led by Father Michael Weera, from the Pattaya Orphanage, Father Michael Picharn, from the Father Ray Foundation, and Father Viyakorn, Vicar General of the Redemptorists of Thailand, the catholic order Father Ray belonged to. 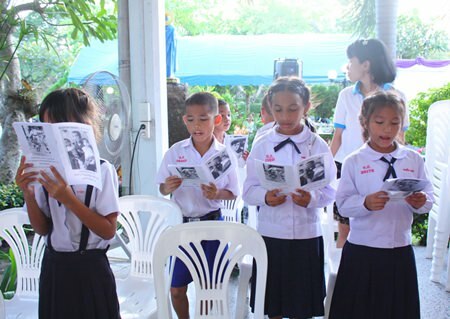 The choir from the Pattaya Orphanage, led by Sister Supatra, sang throughout the service and Father Ray would have been very proud of how beautiful his children sang. Foreign volunteers give alms to the monks. Once the final note of the final hymn was sung, the priests led a procession to Father Ray’s final resting place. As each person, young and old, stood in front of the grave they laid down a single red rose. 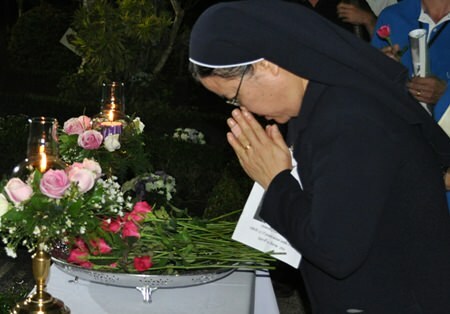 While Thais placed their hands together and performed a wai, others bowed their heads and paid respect to Father Ray, the man whose work changed the lives of thousands and whose legacy continues here in Pattaya. Never too young to make merit. 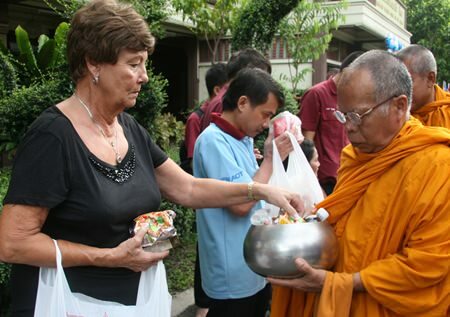 Sharron Purtell offers food to the monks. Father Michael Picharn presents communion to Toy, Father Ray’s ‘right hand woman’. 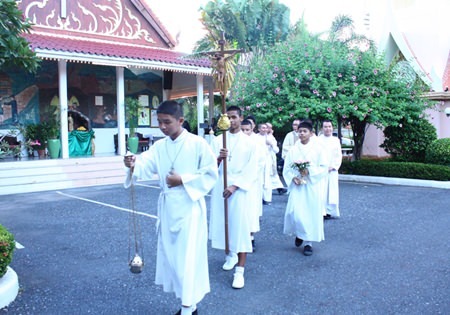 Alter boys lead the procession into the church. Sister Supatra pays her respects to Father Ray. Father Ray’s younger sister Sharron Purtell fondly remembers her brother. Children from the projects Father Ray founded each gave a reading. 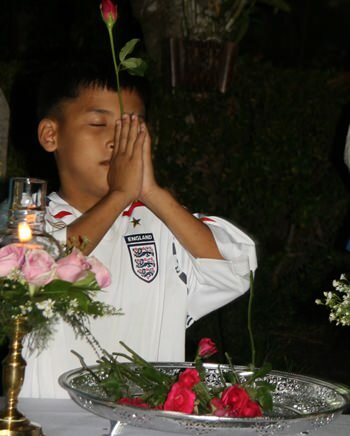 The choir from the Pattaya Orphanage led the singing at the Memorial Mass. Children, too young to remember Father Ray, nonetheless sing with all their heart at his memorial service. 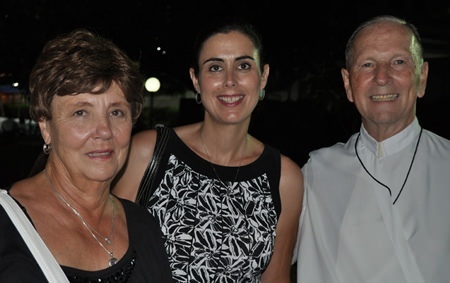 Father Ray’s sister, Sharron, niece Amy, and good friend Brother Denis. Students from the Vocational School left red roses at Father Ray’s grave. Children of all ages attended the service. This young boy never met Father Ray, but still he pays his respect. 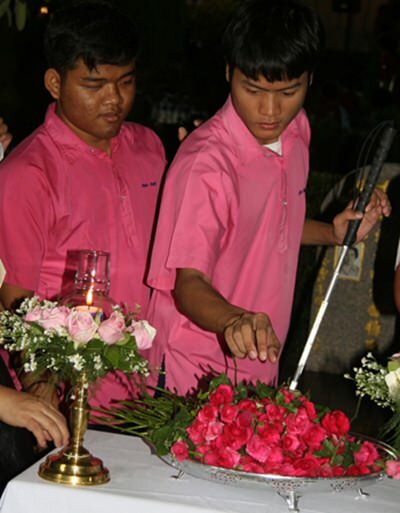 The blind students also attended the memorial mass.